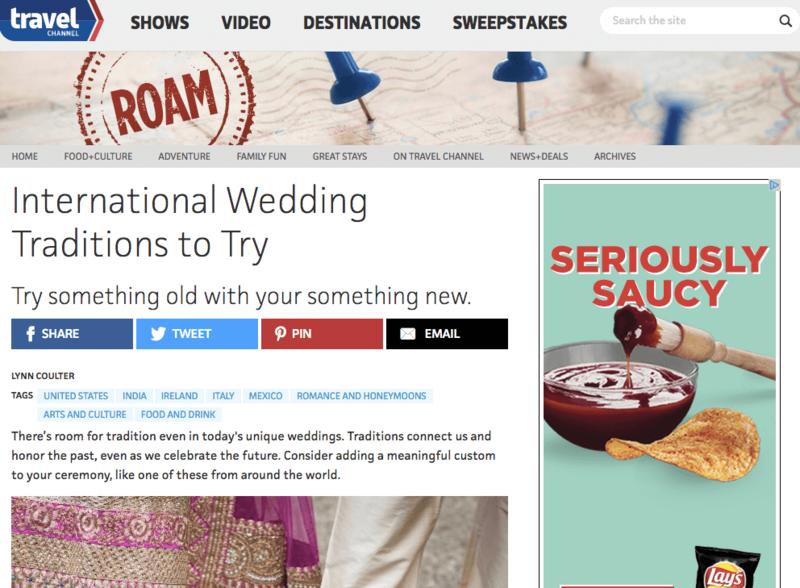 Wedding PR: Travel Channel, Brides.com, Catersource and more! It’s that time again! Another set of amazing client features, including Travel Channel, Brides.com, Catersource and so much more. Check it all out below! Belladeux Event Design, Cocoon Events Management Group, Fantasy Sound Event Services, Passport to Joy, Destination Weddings Travel Group, Rochelle Cheever Photography, Be Photography, Mike B Photography, Elly’s Photography, and Nahid’s Global Events were featured on Travel Channel in the article, International Wedding Traditions to Try. See the full article here. Stephanie Yonce Photography was featured on Tidewater and Tulle with the wedding, Quirky Elegant Wedding with Momofuku Cake. See the full feature here. All Inclusive Outlet was featured on Travel Pulse in the article, Tips from a Travel Agent on Planning a Bucket List Vacation. See the full feature here. OFD Consulting was featured on Timeline Genius with the guest article, Top Educational Events to Attend. See the full article here. Turner Photography Studio was featured on Brides.com in the article, 10 Gorgeous Places to Get Engaged. See the full feature here. Fantasy Sound Event Services was featured on Catersource with the guest article, Time Management in the Sales Process. See the full article here. Nahid’s Global Events was featured on Aisle Perfect with the wedding, Luxury Cultural Fusion Wedding. See the full feature here.